Have you ever tried shopping or visiting around and about with your baby, but without a stroller? I have! When you have a baby or a few young children, trying to carry just one of them around is a quick way to want to go home real soon. One of the most important "must have" accessories for expecting parents is a car seat and a stroller. A baby system stroller is a great way to get value for money and simplicity; a stroller, car seat and baby carrier in one purchase. However, choosing the best travel system stroller can be overwhelming at least. In this combined guide and product review I will discuss some of the key features to look out for and some important factors to bear in mind when choosing the best option for your needs. Why a Travel System Stroller and Not Just a Car Seat and Stroller? When you are the proud parent of a new-born it is also likely that you will be tired, overwhelmed and experiencing a rollercoaster of emotions. Getting out of the house can feel like "mission impossible". The most overwhelming benefit of buying a travel system is it simplifies things, which makes the all-important opportunity to get out manageable when you might not be at your best. The other major benefit is you can transfer baby from car to stroller without waking them up. Super beneficial, especially because car journeys tend to be an excellent way to get baby to sleep in the first place! However, it is not just all about the first month, you also want to buy a product that will last. When you buy a good travel system the car seat element will last the first 6 months at least and the stroller into toddlerhood. Sometimes you may need to buy a new car seat once your child grows out of the car seat. To be honest this is not so different to buying a separate car seat and stroller anyway as you will not likely find a car seat to last from newborn to toddler stage when a car seat is no longer required. Travel systems tend to be larger than a car seat and stroller; you need to bear this in mind. If you are living in a very small apartment, or have a very small car, they may not be the best solution for you. Having said that one large item is probably better than two medium-sized items in many cases. You need to consider the space you have and consider how the product will work for you. How Do They Work Anyway! The travel system strollers are made up of three elements. A Baby Car Seat Base. This is fitted to the car. Then the seat itself can be attached and removed from the base. A Car/Stroller Baby Seat. This is attached to the seat base in the car, then to the stroller when out and about. This means you can move the baby between car and stroller without removing them from the seat itself. A Stroller. The car seat is attached to this to use as a stroller when your baby is young. Then when the baby is too big for the car seat the older baby/ toddler can sit directly in the stroller without the car seat being fitted. Safety should always come first when it comes to your children. Therefore, when choosing your travel system start by considering the car seat element of the product. Make sure this element fits all the best safety requirements and this way you can narrow down your choice. Motor vehicle accidents are a leading cause of death in children ages 1-18. One in 3 children who die in a motor vehicle collision are unrestrained. The AAP have written a safety guide, which you can consider when considering the car seat element of your travel system. Don't use a second had car seat because it could have been in an accident without you knowing. The travel system strollers come in a few different styles. Choosing the best style for you will depend a little on your lifestyle and preferences. Four-wheeled strollers are the most stable of the available styles and for use on unstable terrain, they are by far the best option. However, they are also the largest and most bulky of the different available styles. The four-wheel strollers are also harder to maneuver in tight places. These are the best option for people who want their stroller to be stable and to have room to carry the baby bag, shopping etc. They may not the best option for people who live in crowded cities or who have to negotiate narrow pathways, stairwells or other routes where space is tight. Three Wheel strollers are a great option for people who would like to maintain a lighter model of a stroller and who live in a place where maneuvering in crowds or in tight spaces is a part of daily life. If you are not a person who jogs or who lives a very active lifestyle then this style of stroller may not be for you. 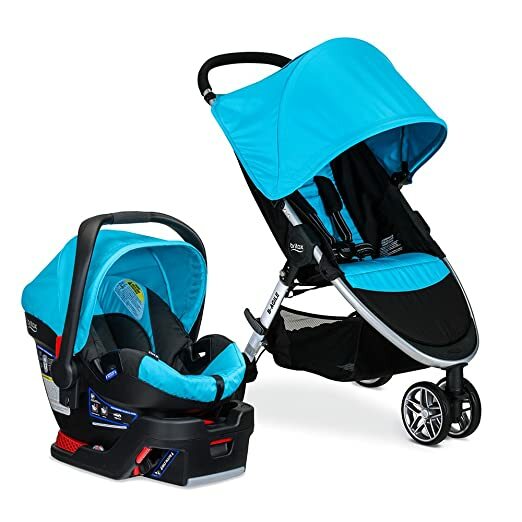 However, if you love jogging or getting into the outdoors then this stroller will be a great way to maintain your fitness routine even when you have a new-born/ growing baby to take care of. If you have more than one child, with short spacing between them then a double stroller can be a lifesaver. If you have ever been stuck at the mall with a tired toddler ready to throw a tantrum, and a baby stroller with no place for the toddler you will know this style has an invaluable role to play! The obvious disadvantage is the extra size and weight of the product, but I think the style is well worth considering if you have two or more young children. I have not reviewed style on my list because I think the choice is too limited. The travel system strollers are generally very well designed and pretty ingenious really. However, using them can be difficult and fiddly as you try to figure out and get used to all the different settings. Even if you are not keen on reading instructions, I strongly advise you to push yourself to do so. You will get the most out of your purchase that way. Or you can also go for the designs that are the most intuitive! Some travel systems have some particularly "cool" design features and when there is such a plenitude of choice some of them can make a particular design stand out. Keep reading here are my reviews of five products I have chosen. This is a popular and well-designed product. The car seat features the LATCH system and has other excellent extra safety features, including protection from side impacts and design features to make fitting the seat base into the car easy. You can read more about the company's commitment to safety on their website. Using the product is very easy with the intuitive design featuring a simple push button and flick to fold up the stroller. Plus, the car seat for the baby fits into the stroller easily as well. I wish I had bought this product when I had my second child! The stroller is three-wheeled, which makes it easy to maneuver and light in comparison to other four-wheel travel systems. Despite that, it still has a large compartment for storing baby equipment, shopping etc. The car seat fits a baby up to 35 lbs which is a larger baby than most travel systems will fit (standard is 30 lbs). The stroller will fit a child up to 55 lbs, which is also a larger child than most travel systems will allow for (standard is 50 lbs). Even considering all the benefits this choice of the stroller is not the cheapest product on the market. However, in my opinion, the quality of the product, particularly with their focus on safety, does support the price. Car seat will take a baby up to 35lbs and the stroller a child up to 55 lbs. High end price, may not suit all budgets. This Graco product is a four-wheel style of a travel system and even though it has four wheels it is very lightweight at 20 lbs. • A folding tray built into the stroller and another tray for mum! • Multiple reclining positions for the stroller seat. This is another product that will last well, fitting a baby up to 50 lbs in the car seat section of the product. I like the way you can fold the stroller quickly and easily. I also like the lightweight design of the product. This will be a good choice for mothers wanting the stability of the four wheels but not wanting a hefty product to maneuver as well. I am not 100% keen on the style and colors of the travel system but I think for a budget option it is perfectly fine. The product is very affordable and will be a good option for people who want to keep their costs low without sacrificing safety for the car seat part of the product. Not as many safety features as some other products on the market. This is a very sleek, stylish and well thought out design. The car seat part of the travel system has a premium LATCH system and a "SuperCinch" for the LATCH tightening, which helps to achieve an easy and tight fit for the car seat into the car. I like the considered design that allows you to remove the seating material part of the stroller when you are using the stroller with your baby and car seat. Then you only need to return the seating material to the stroller when you are ready to use the stroller as a stroller for your toddler. This way the material stays nice and clean and makes the product less cluttered looking in the early stages. When this baby folds down (I should add super easily) it is also really small so it will make a good choice if you have limited room in the house, even as a four-wheel product. A large basket under the strollers is useful for all your baby gear and shopping. A nice removeable tray for baby and cup holder and compartment at the stroller handles is useful for mum. This is not the cheapest product on the market but it has the safety of your baby as a priority, and the style of the product definitely makes the price worthwhile to me! Higher price may not suit every budget. 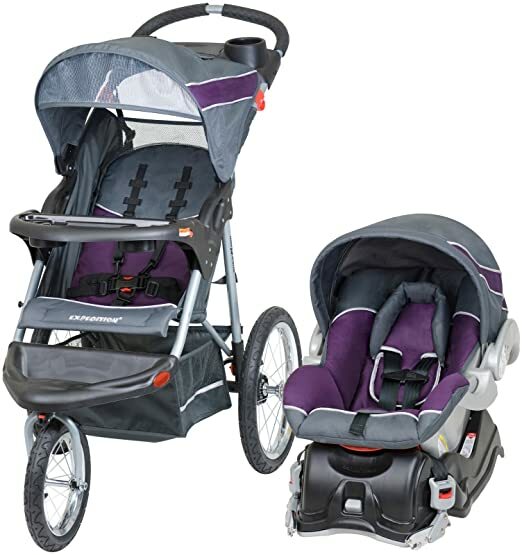 This jogger stroller is designed for parents who love to escape into the outdoors; hiking, jogging or who otherwise want to use their stroller on uneven terrain. If you are living in a city with no trips to the countryside you are probably not the best person for this product. If you are an active family this stroller will be a wonderful product to help you continue your lifestyle without missing a beat because of your new arrival. The parent tray and compartment also have the cool feature that the compartment itself is covered. I would have found this really useful the other day because I wouldn't have lost my keys when they bounced out of the uncovered parent tray compartment of my stroller, which I had put them in. The car seat and car base are pretty bulky when compared with other products. However, this is a product designed for a purpose (to get outside) so you need to bear that in mind when considering the purchase and allow for some of its "negatives". This is a very affordable product given with a low price and lifestyle specific design. Very affordable price good if you are on a budget. Bicycle stroller wheels may require some maintenance. This travel system is very stylish despite the remarkably low cost! When comparing this with other more expensive product it holds its ground and compares very well. Mostly seeming to lose ground when you comparing the weight of the stroller itself with other models. The car seat has the LATCH safety system and all the usual desirable features are present. The stroller folds down easily and compactly. The chair has a "quick click" system so you can attach the car seat to the seat base easily. This is definitely a big bonus; my baby always hates the getting "installed" part of going out in the car, so being able to get her in the car quickly is great. Another bonus is the harness, which has four settings to make getting baby in and out easily even when growing fast! 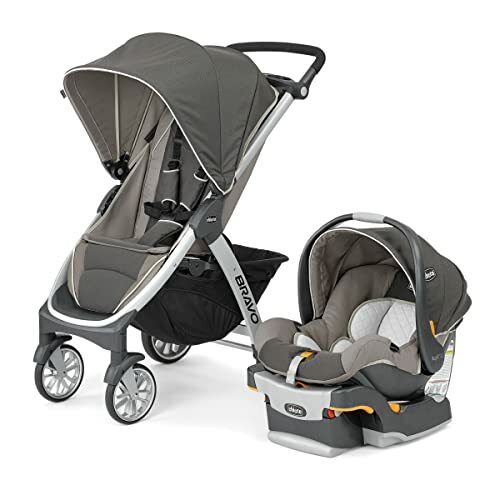 I particularly like the canopy, which can fully enclose your baby when the stroller is fitted with the rear-facing seat. There is a peek-a-boo window so you can still see your baby snug inside, fully protected from the elements. The travel system states it is airline ready so this will be a useful feature for families who travel a lot internationally. Overall, this nice stroller will make an excellent purchase for most people who don't have any special requirements for their travel system. A heavy unit in comparison to other similar models. I hope my guide and reviews have helped you to see the wood for the trees! I think from all of them my favorite has to be #1: Britax B Agile and B Safe because I love their focus on safety. 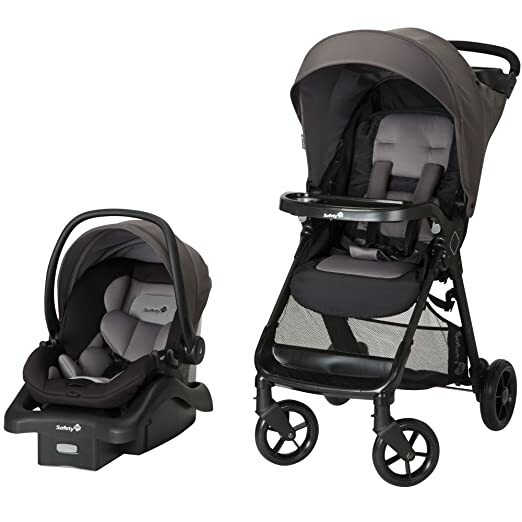 However, if I didn't have the budget for the Britax travel system I would go for #5 Safety First Smooth Ride because for a lot less money their product is very comparative to #1. Do let us know your thoughts in the comments. Have you tried any of the travel system strollers above? Which is your favorite?